Last week, I did a post about the eldest child of Charles Gordon and Matilda Stewart, Margaret Nicol Gordon. Their second eldest child was Charles Gordon. I have mentioned most of the information I have found for Charles in other posts, and he appears to have not married, so I have decided to do this post about their next child, Donald. Donald was born 1 January 1843, while the family were travelling to Australia from Scotland, on the “Gannet”. Donald was baptized, along with his two brothers, John and Andrew, 4 August 1850 at the Presbyterian Church in Melbourne. Donald married Mariah Davidson in 1873. Minnie Liston Gordon married Wm Geo Williams in 1909 (reg. no. 3680). Finding the marriages for their sons required double checking against other resources. There was just one marriage entry for a David Gordon, without any other given names, between 1892 and 1924 – David Gordon married Alice Janet Pratt in 1904 (reg. no. 3403). More research needs to be done to determine if this was the same David Gordon. I haven’t been able to find a death notice for David, or a will for him. 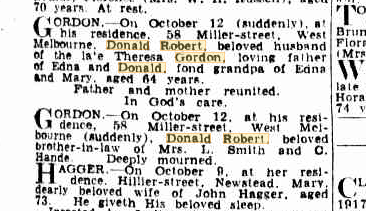 I found the death notice for Donald Robert Gordon, which lists his wife as Theresa. Donald Robt Gordon married Theresa Marie Hande in 1908 (reg. no. 1781). I found the following obituary for Daniel, which confirms his wife was formerly Ada Lord. There was just one marriage entry for Douglas Young Gordon – he married Olga Loucas in 1911 (reg. no. 10292). Since Douglas died in 1962, his death notice/obituary is not available online. I therefore decided to use the Electoral rolls to confirm that this was the right marriage. Australian Electoral Commission, “Australian Electoral rolls, 1901-1954,” online images, ancestry.com, ncestry.com.au (http://www.ancestry.com.au/), Douglas Young Gordon, Electoral year 1912, Subdistrict Yarraville District Melbourne Ports State: Victoria. His brother Duncan Stewart Gordon, and their mother Maria, were living at 36 Somerville rd Yarraville. Douglas and Olga were still living at 51 Somerville Rd Yarraville in 1954. Matilda Triszvan Gordon was born in 1873. She married Herbert Walters in 1898, and died in 1930. David Gordon was born in 1876, and died in 1924. Donald Robert Gordon was born in 1877. He married Theresa Marie Hande in 1908. He died 12 October 1941. Duncan Stuart (or Stewart) Gordon was born in 1879. He married Nathiel Decla Loulie in 1924. He died 28 June 1948. Douglas Young Gordon was born in 1881. He married Olga Loucas in 1911. He died in 1962. Minnie Gordon was born in 1883. She married William George Williams in 1909. She died in 1958. Daniel Davidson Gordon was born in 1886. He married Ada Rubina Lord in 1913. He died 19 March 1944. Mabel Gordon was born in 1888. She married Thomas Johnson in 1910. She died in 1943. Mildred Rimmer Gordon was born in 1891. She married Alex Hartley Walton Alexander in 1913. She died in 1975. Donald Robert Nicol Guernet Gordon died in 1911. His will is available from the Public Record Office Victoria website. 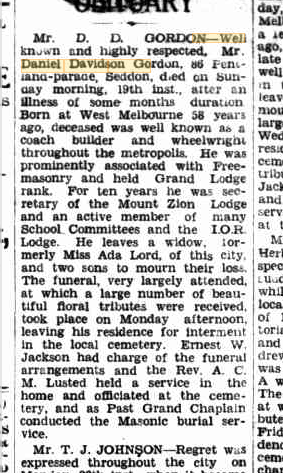 The Wills and Probate index showed he was a wheelwright from Yarraville, and he died 17 March 1911. In his will, he left his estate to his wife Maria, and he also named her as sole executrix of his estate.